Dimension Drive, from 2Awesome Studio, is a teleportation-based shmup where you must pilot your ship across two battlefields. 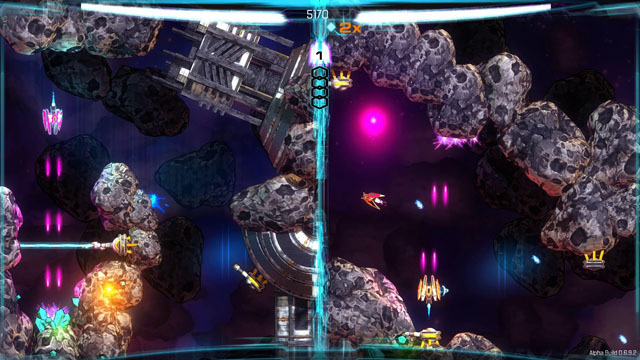 As you fly, you will encounter impassible lasers, sprays of bullets, other objects that require you to move to the opposite screen, teleporting to the same relative position on the other side. Your ship is capable of emitting a spray of projectiles that may be upgraded to several power levels, and the bullets may be aimed behind the ship to strike enemies you have already passed when you teleport across screens. If you're having a hard time keeping track of the action - or if you don't have two brains - you can bring along a friend for 2P co-op. The game is coming to PC, Mac, and Linux via Steam later this year.